Static electricity works because electrons are strongly attracted to protons, right? But, in atoms, electrons are right there, next to the protons in the nucleus. Why don't the electrons zip directly into the nucleus and stick to the protons? Everyone who has ever sat through fourth grade knows that when you rub a balloon on your hair, or your sweater, you can stick it to the wall. You can do this because the rubbing caused the balloon to accumulate a lot of electrons. Electrons are attracted to protons, and repelled by other electrons, so when the balloon was pushed near the wall, the electrons in the wall rushed away, leaving exposed protons. These half-naked protons were irresistible to the electrons in the balloon and the electrons rush towards the protons, taking the balloon with them. The question is, why did those electrons move from your hair to the balloon in the first place? If they were so smitten with protons, they had plenty of them right there in your hair. Uncharged atoms pair equal amounts of electrons and protons. The electrons should zoom right to the atomic nucleus. 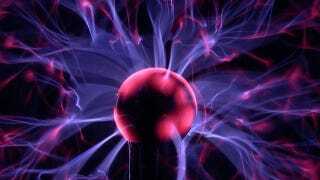 In classical physics, electrons should fall into the nucleus even if they weren't attracted by the charge of the proton. Early models of atoms had electrons orbiting the nucleus the way a planet orbits a sun. Orbiting in a circle means making a lot of changes of direction- which means acceleration. When an electrical charge undergoes acceleration it gives off electromagnetic radiation. Electromagnetic radiation is energy, and the electron can lose one of two kinds of energy; kinetic energy (or speed), or potential energy (or distance from the nucleus). Either way, it will eventually crash into the nucleus. Let us think of a single electron floating in space. How do we even measure its kinetic and potential energy? Start by imagining a single proton, far away. Together, they can unite and form a hydrogen atom. As we measure their progress towards each other, in terms of energy, we will see in many ways what we see in classical physics. The electron, approaching the proton, will have kinetic energy and potential energy. When it is far away, it will have a relatively huge amount of potential energy, the same way objects raised high above the ground have huge amounts of potential energy. As it moves towards the proton, it loses some of that potential energy. Some of it is radiated away, as electromagnetic energy. Some of it is converted to kinetic energy. Kinetic energy keeps an electron hopping, and keeps it from staying in a nucleus and combining with a proton. Here's where the deck is slightly stacked in favor of electrons not combining with protons. The kinetic energy, if the electron is in the nucleus, is infinity. The potential energy, if the electron is in the nucleus, is negative infinity. But if you want to figure out the kinetic energy at any point, it's twice the decline in potential energy. In other words, the kinetic energy has more heft, and the electron stays out of the nucleus. The final distance of the electron from the nucleus that represents the balance of those two energies and their two-to-one proportion. There is a problem with thinking of electrons as little chunks of matter orbiting a bigger chunk of matter. They don't actually behave that way. An electron can't be thought of as a planet, and must instead be thought of as a kind of cloud of probability. And not in the sense that that's the most useful way to think of it - that's what an electron actually is. To understand the electron's behavior, we have to think about where that cloud will be the most dense, or where there is the greatest probability of an electron, or where there is the maximum negative charge. Let's picture the journey towards the proton-hydrogen nucleus again, except picture it as you would if you were measuring each tiny volume of space with a probabilitometer. Far away from the nucleus, the probabilitometer would register virtually no probability of negative charge. As you slowly move closer, the meter would go up and up, until it registered highest probability at the nucleus. This seems to contradict both what we've just figured out above and reality. The trick here is understanding that a tiny volume of space on a line a certain distance from the nucleus is not the best way of measuring the probability of an electron being in any particular volume of space. We're not puzzled about whether the electron is above, below, to the left, or to the right of the nucleus. We just want it a certain distance away. Meaning it could be anywhere on a spherical "shell" around the nucleus. What we want is the volume of that shell. The volume of that shell is the surface area of a sphere, 4πr2, times whatever arbitrary width we choose for the shell. The volume of that "shell" at r = 0, or right in the middle of the nucleus, is zero. As we move outwards, r increases slowly, but volume 4πr2 increases pretty fast. That being said, the farther we go away from the nucleus of the atom, the less likely that atom's electron is to be found. So the highest probability of finding the electron is going to be the "sweet spot" radius where the volume of the shell is big enough that the probability is high, but the distance from the nucleus isn't too large for the probability to be low. Graph that and you find that the electron's highest probability is close to the center of the atom, but not inside it. Here's a nice little argument for why electrons don't just zoom into protons and combine to form neutrons. All you need to understand it is a little addition. Combine a proton and an electron, and charge-wise, you've made a neutron. That's what should happen if electrons fell into a nucleus. A proton's mass is 1.6726 x 10-27 kg, and an electron's mass is 0.00091 x 10-27 kg, but a neutron's mass is 1.6749 x 10-27 kg. So the mass of an electron and proton combined is still nowhere near enough for a neutron. If you want them to combine together, you would need to add energy, or mass, or both.